JoBeth Allison’s Southeast-themed quilt will be raffled for disaster relief. 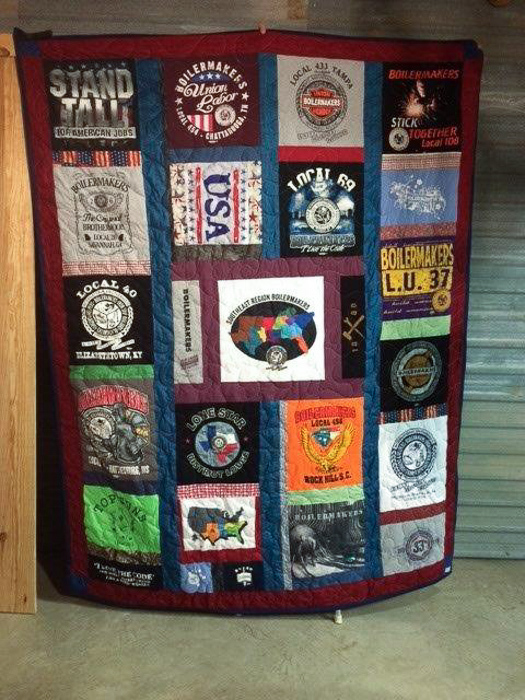 IN AN EFFORT to raise money for the Boilermaker Disaster Relief Fund, JoBeth Allison, wife of Local 69 (Little Rock, Arkansas) BM-ST Rodney Allison, crafted a unique, Southeast-inspired quilt as a raffle item. With the help of Southeast district business managers and several local lodge business managers, she collected T-shirts from construction locals for the top side of the quilt. JoBeth also included shirts from MOST and the Southeast Area Joint Apprenticeship Committee. Fitting the T-shirts together to create a cohesive theme was “kind of like putting a puzzle together,” she said. The quilt’s backing is a red, white and blue patriotic pattern. JoBeth decided a one-of-a-kind design would be an effective way to get more people involved. And while the idea originated with L-69, she is quick to point out the quilt represents the entire Southeast area. The quilt will be raffled off during the Southeast Area Tripartite Conference April 10-12 in Destin, Florida. Ticket sales will begin sometime in January, according to Mark Garrett, Director of Health and Safety Services and administrator of the Boilermaker Disaster Relief Fund. He said that 100 percent of the money raised will go directly to Boilermakers in need. He said many locals already contribute money and locals that have been recipients of disaster relief are some of the fund’s biggest donors. “It’s nice locals are getting involved and giving back,” he said. Boilermakers International is developing a website to make it easier for members to donate to the fund. The website address will be published in a future issue of The Reporter. Locals that would like to hold fundraisers for Disaster Relief can contact Garrett at 225-276-6796 for information on how to get started.